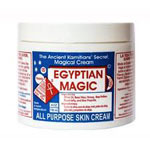 This Egyptian magic cream has allegedly been created from an ancient secret recipe but the company that manufactures it has only been around for a few years or so. It can allegedly be used for anything from dry skin cure, to hair conditioner, to lip balm, to night moisturizer, to eye cream. It serves a very wide variety of purposes according to the site which is what brought me to buying it. However there were a lot of problems that I had with it and it didn’t seem to do one thing very well. Contains ingredients: Olive Oil, Beeswax, Honey, Propolis, Bee Pollen, and Royal Jelly. Though this product was advertised as being able to do so many different things, it seemed to me that it wasn’t able to do any of the things that it advertised particularly well. The consistency was too thick to be absorbed by the skin well but it was too thin to act as a hair conditioner. It was far too greasy to use as a lip balm and besides that, who would want to kiss you when your lips smell like a garbage lid? It is a wonder to me that anyone was able to get all of those uses to work so well for them, because none of them seemed to work for me. I would recommend most people stay away from this one.